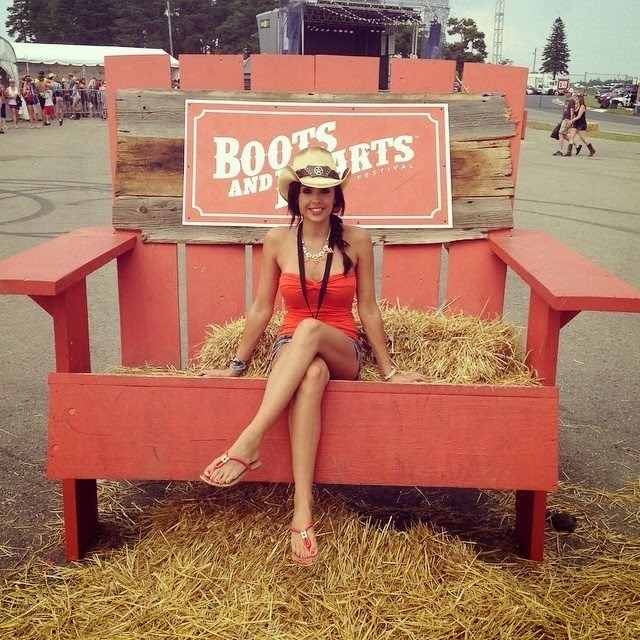 Us C&C Girls had an amazing time again this year for the 2014 Boots and Hearts Country Music Festival. The 3 day festival took place at Mosport Park in Bowmanville, Ontario for the Canadian long weekend July 31 to Aug3. The sold out venue packed country music lovers from all across Canada and the USA all there to see headliners Toby Keith, Blake Shelton, and Luke Bryan. We arrived Friday, and just missed the rain storm, but that didn’t stop headliner Toby Keith from rocking the venue. Fans stood in puddles of mud for a true country experience to see the legendary Toby Keith perform some of his greatest hits such as Should’ve been a Cowboy, How do you Like me Now, to his current hit Red Solo Cup. Nobody seemed to mind a little rain. The place was packed with screaming fans all singing along. On Saturday we made sure to arrive early to catch some of the smaller country artists and the special showcases at the Coors Original Tent. We even made it across the park to watch the Miss Boots & Hearts contest as 20 contestants competed for the chance at being crowned Miss Boots & Hearts 2014. The food vendors were amazing again this year and a larger liquor and beer selection were featured. Our favourite beer tent was at the Coors Original bar where they had a dance floor and hay bales to give the real country saloon feel. On Saturday night Lee Brice took the stage. He’s an amazing up and coming headlining artist. We loved hearing his songs “hard to love” and “A woman like you” live but the crowd went nuts when he joined Luke Bryan on stage for a few songs. I had never seen Luke Bryan perform live before but I am now hooked. He is so much fun to watch live as he really brings energy to the stage with his boyband like dance moves, catchy songs and interactions with the audience. I think Luke Bryan actually shook it for us. On Sunday we were able to catch the Gospel Brunch along with some of the artist meet and greet lines for upcoming Canadian talent. There’s really so much to do throughout the three day festival. The campers seemed to have an amazing time as after the nightly shows the party would continue on to the Country Dance After Party. Sunday had another outstanding lineup. Country cutie Hunter Hayes took the stage and wowed us with his performance. Hayes may only be 22 but he can play over 30 different instruments and wrote every song on his album at the age of 19. After Hayes the two finalists in the Emerging Artist Showcase presented by Sirius XM battled live on the main stage to be this years’ title winner. A big congrats to Trinity Bradshaw this year’s winner! Finally the moment I had been waiting for.... Blake Shelton took the stage. He was my highlight of the entire weekend. After stealing my heart on The Voice, seeing him live was an incredible experience. He played a bunch of his greatest and latest hits including “Boys Round Here “ , “Some Beach” and even brought us back to his first album singing one of my all time favs “Austin”. The weekend seemed to pass so fast—time flies when you’re having fun. We can hardly wait to hear when next year’s lineup is announced. Keep checking back for updates and when tickets will become available. Best to purchase early as tickets sell out fast! Boots & Hearts is definitely the best country music festival in Canada.